Ian Prior, noted epidemiologist and arts patron, died earlier this week. Luncheon under the ash tree, an exhibition organised by Aratoi which celebrated Ian and Elespie Prior’s art collection, toured galleries around New Zealand a few years ago. A couple of works on show in and near Te Papa stand in tribute to Ian. The first is Regan Gentry’s Green Islands, the inaugural Four Plinths Temporary Sculpture Project which has been on show in the plaza outside the museum since December 2007. It was commissioned by the Wellington Sculpture Trust, which Ian helped found back in 1982. 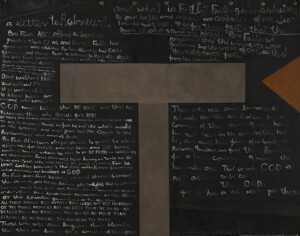 The second is Colin McCahon’s painting A Letter to Hebrews, on show in Toi Te Papa. In his memoir, Ian recalled writing to McCahon and suggesting a painting based on the New Testament letter. Ian decided that the resulting work, which quotes from Chapter 11 of Hebrews — ‘And what is faith?’, really belonged in a museum. It was acquired by the then National Art Gallery with the assistance of the Willi Fels Memorial Trust. The Trust was named in honour of Elespie’s grandfather and has been a benefactor to a number of New Zealand artists, writers and musicians.